Recently, I spent time in Shenzhen China and Bali. What a street food array of amazing treats! I went to each place, found a local street food place I liked the look of and watched each one for a bit, making sure the joints were clean and the staff cooked well. Then, through the power of google translate I asked the owner to cook for me with no salt. Rini in Denpasar and the Uyghur Halal guy became my silent and nodding friends every night I spent alone, walking through the streets thinking about Constant Current Charge rates, Ohms law, building a battery test environment for hot looking battery banks and getting my brain around the infinite possibilities of my new little company, The Women of Steele. Here are a couple of total wins I found on my travels that I have come home and tried with relative success to make on the back yard engine that could, my Weber Q. Literally just soak the sticks in water and then oil with coconut oil. Leave for at least 30 minutes. Seperate garlic cloves, leaving them in the skin and skewer those potent bad boys up. 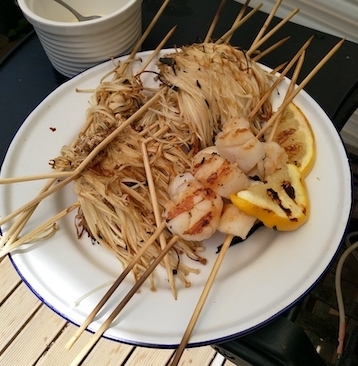 Stick onto a hot chargrilled BBQ surface for about 8 minutes, close the weber hood and turn once at 4 minutes. Chargrilled Chinese cabbage and spring onions on .. yep you guessed it, sticks. About 8 of the bottom halves of leaves of a Chinese cabbage. The denser the better. Mingle the spring onion in between the cabbage keeping the slices at the base and quite thick. Now the Uyghur folks do this same above process with all sorts of things like Chicken feet and whole fish. Tofu and spring onions on sticks with ginger is great. Give it a bash. It chars beautifully and looks like a million bucks. I wish I could give the Uyghur community in China a million bucks. Reckon they might need it more than me. Balinese Fish in Banana leaves not on a stick. 4 big ole fresh banana leaves (you can get them frozen from an Asian grocer but fresh is best. I have my own banana tree so it’s easy. Any ole whole, fresh gutted fish. Just get whatever is fresh. I use Red Snapper and milk fish generally here in Adelaide. Gut and scale the fish of choice. Oil the fish up and wrap it up tight with the twine in the washed banana leaves. 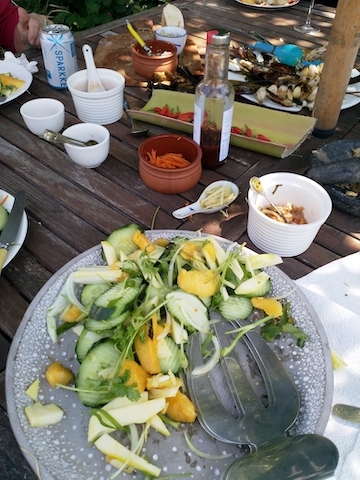 Balinese Salad with green and ripe mangoes, Spring onions, Fresh ginger, Tumeric, Onion with a chilli, sugar and vinegar dressing. Not on a stick. 3 Spring onions cut diagonally finely. 1 Kedondong (some Balinese nutty fruit thing I can’t get in Australia so I do without but bloody hell it tasted good. Looks like this! Coriander sprigs to make it pretty. Don’t overpower this tho! Scatter and layer the rest of the ingredients on top and add a few sprigs of Coriander if you feel like it. Balinese Mortar and Pestle garlic, onion, turmeric szechuan peppercorns and ginger mash to go with it all. 1/2 a finely chopped brown onion. 6 cloves of peeled and oiled garlic. Stick a bunch of the peeled garlic cloves in oil at least a night before in a jar in the fridge. Mortar and pestle the ginger, turmeric, garlic and onion with muscle and intent. Mash it all up. Add the chilli and chilli flakes in and let it all settle at least an hour before implementing into your dish.